Shail, Darryl, Will, Mark and Sue M make up the Eldership Team (left to right as pictured). 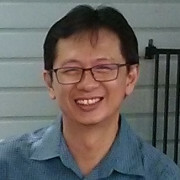 Mark was born and raised in Kuala Lumpur, Malaysia as a Buddhist. When he was 15, he had a life-changing encounter with Christ. In 1983, he responded to God’s call to serve with Youth With A Mission, an international, interdenominational mission agency. He served in a number of capacities but his primary role was that of a trainer and mentor in numerous discipleship and leadership courses in Brisbane and overseas in Southeast Asia. Mark served as a part-time Associate Pastor at Windsor Road from 2008 until his appointment as Senior Pastor in June 2013. He has a passion for discipleship, helping believers discover and live out their fullness in Christ daily for the work of ministry. Mark has been married to Sue since 1990. He enjoys spending time with her and their three adult children & daughter-in-law. He likes his tropical fish, die cast car collection and good Malaysian cuisine!